About 10 minutes walk away from where I’m writing this is Fellows Road, Belsize Park, north-west London where a man in his forties was reported stabbed just after 7pm yesterday evening. The attack warranted less than a 40-word paragraph in today’s London Evening Standard. An online report said the victim was in a “stable condition” and that a man had been arrested in connection with the crime. Of course I know nothing about the background to the stabbing – whether the men knew each other or if the violence was the result of a mugging. But it underlines knife crime is an ever-present threat in the capital. In a separate article the newspaper reported latest police statistics show 40 Londoners a day are threatened by knives, of which more than a quarter suffer some injury. Overall gun crime is down but those involving knives continue to rise despite a series of initiatives to address the threat. The young are often the victims. Tragically five teenagers have been stabbed to death so far this year. Between February and April, according to Met figures, London knife offences rose 8.3 per cent to 3,636 compared to the same three months last year. The actual number is probably a good deal higher given anecdotal evidence that a considerable number of incidents involving knives go unreported. There is no easy way of breaking the cycle where increasing levels of knife crimes encourage more youngsters to carry weapons for their “protection.” Everything has to be tried to stamp out this curse starting with better detection and stiffer sentencing. But these don't come cheap in a time of austerity. What doesn’t make any sense is for local authorities to squeeze mentoring and other youth projects out of existence as part of the spending cuts. While the £18 million the Home Secretary Theresa May announced in February to combat knife, gun, and gang crime is hopelessly inadequate set against, say, what the UK is spending on its regime change adventure in Libya. 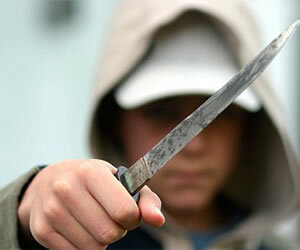 The kids dying from knife and gun crime are getting younger. On the gangland level it is because their fathers are already 'banged up'; and so the gangland mantle is falling on ever younger shoulders.